We know the rainy season in Botswana is during their summer months, we also know that vast areas of Botswana is table top flat. 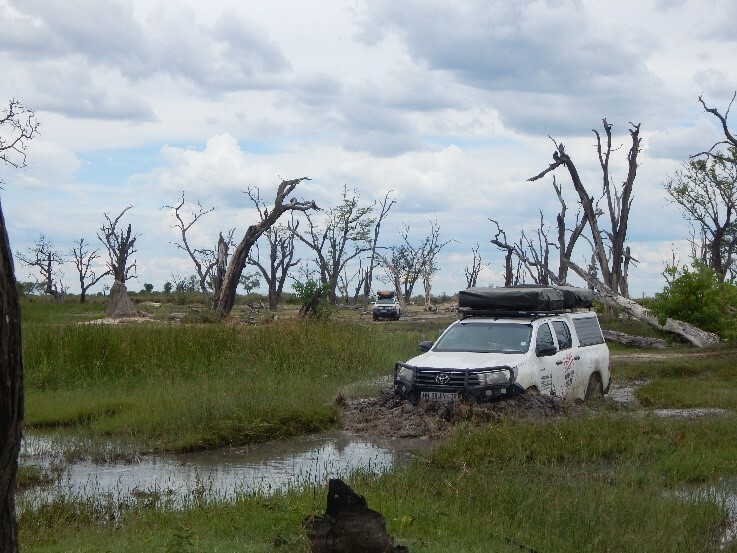 The Halfway Toyota Dealers staff of 6 Hilux’s and 11 staff members were headed for an adventure through the wilds of Botswana, taking in the Magadigadi Pans, Moremi game reserve and then Chobe national park over a period of 10 days. 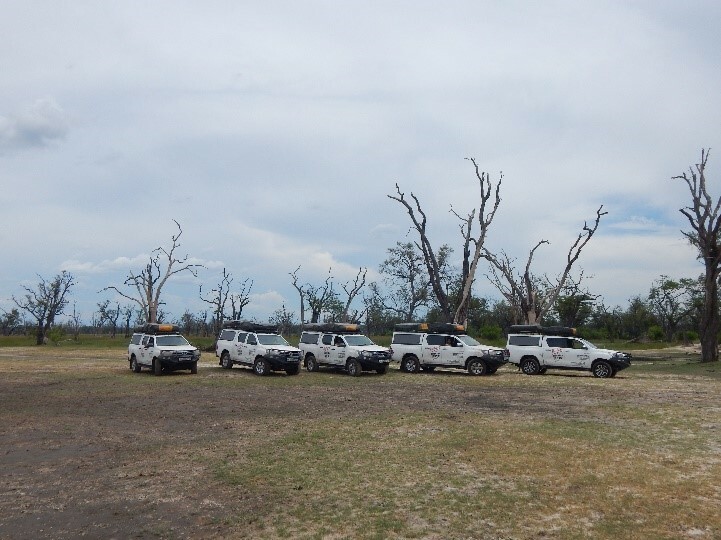 The group was very well prepared, six Bushtracker Hilux’s which come complete with roof top tents, bedding, gas bottles, pots, pans and cutlery. The vehicles are also upgraded with Old Man Emu suspension and front bumper replacement bars and long range fuel tanks, ready to take on Africa at a moment’s notice. Mails were sent out listing what each person should take with, including rain coats and a dry pair of shoes. I would be doing the catering, which for the first few days presented itself with a hurdle, in that SA had just been reported to have Foot and Mouth disease. This new development put an abrupt ban on all fresh meat passing through the border posts. Fresh fruit and vegetables have been on the prohibited list in Botswana for some time already. A last minute phone call to Kubu Island also informed us that The Magadigadi Pans were under water and were totally inaccessible by vehicle. A new route was quickly put together and the relevant booking made for our new destination at Khumaga camp in the Magadigadi pans Game reserve. The vehicles were packed and all was set for a 05h00 departure for Khama Rhino Sanctuary, straight after a quick formality of singing happy birthday to one of the crew. All this at 05h00 in the basement of our B&B. She was also presented with a just in case Poop Scoop and toilet roll. We made good time and were at the quiet, friendly and efficient Stockpoort border post by around 9.30am. There were mixed feelings about this new adventure, for some it would be their first time camping, never mind sharing the camp with wild animals who could pop in at any time, day or night whilst others had been into this sort of environment before. 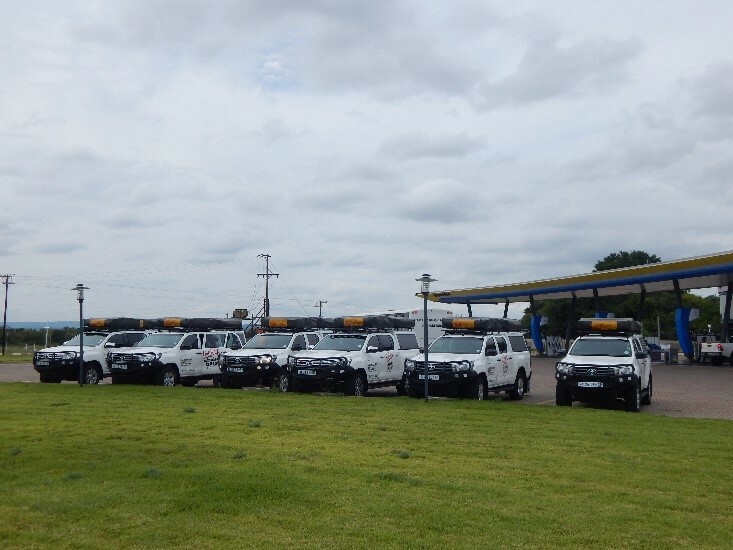 Our first stop over was at our Halfway Toyota dealership in Serowe, a small but busy business serving a large area in central Botswana. After meeting and greeting, catching up on local news we were soon driving out for our first night stop over at the popular Khama Rhino Sanctuary and our first braai in the bush and washed down with St Louis, the local brew which is also a very pleasant beer. No need to first set up camp, we had roof top tents and were first going for a game drive, which we did and also happened to see a good variety of game, including white Rhino. By the time we got to our camp site there was a sense of urgency to set up the tents before the heavens opened up upon us. That night, the heavens emptied themselves upon our camp site. Lucky for a short break when we were able to braai something to eat before the rain continued. After the morning briefing we were on the road to Khumaga, a few hours away. Our first challenge was the Boteti River around 2 kilometers before our camp site. The river was deep and we were advised to take an alternate route of three to four hours which would bring us into camp from the north. 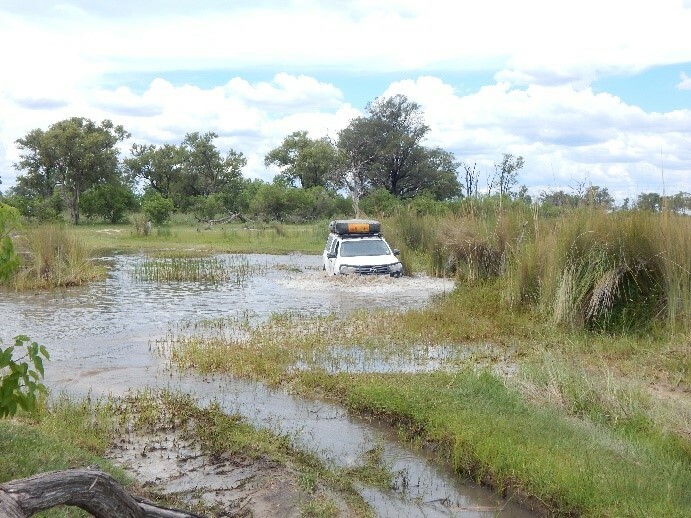 We were on an adventure and up to the challenge, so after checking for Crocs, one of the taller members waded through most of the way, but for us that was enough, we were going through. For those from KZN and the Cape, we had been on the road for 3 days now and it was time for the bush court to settle any members with wayward tendencies. It was a lot of fun and those who would not take the “Straff Dop” did push-ups instead. Watching the push-up in progress really was a sorry sight and a sure sign that we were probably not the most energetic convoy in Botswana. It was also easy to see where this groups strong points were, the bottle was meant to last for more than just one hearing. The following day we had an early departure with a game drive along the banks of the Boteti River planned, and how rewarding it turned out to be with a good sighting of two young male lions leaving the river bed for the higher ground on the banks. The bird life was good too as we were presented with quite a variety of different species. Sedia Lodge in Maun was to be our next destination and home for two nights. Here we camped on the banks of the Thamalakane River which is fed by the waters of the Delta. 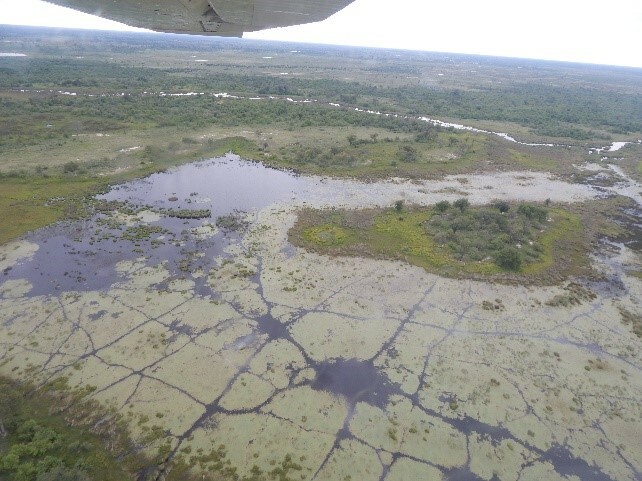 First thing in the morning five of the crew took the 45 min scenic flight over the delta which really gives one a true perspective of the size and vastness of the delta region and the numerous species of wild animals that inhabit the area. 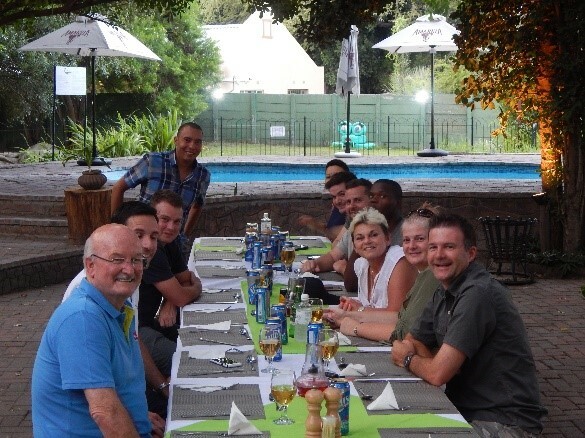 That evening we had dinner together with members of the Halfway Toyota Ngami, Maun team and two from head office in Scottburgh. In fact, it was so good that we all had dinner together the following evening as well, this time at the Island Safari lodge a few kilometers away. 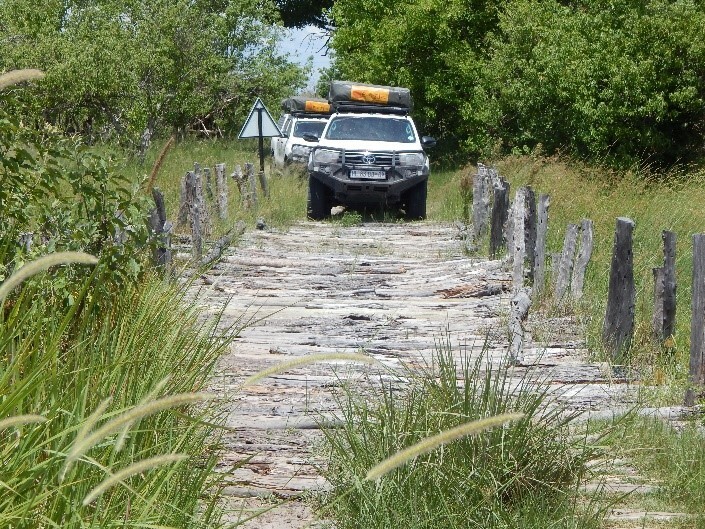 Our next stop, and also for two nights was Xakanaxa Camp in Moremi, on the banks of the Delta. The weather by now had turned on us and we were experiencing quite a bit of rain. Over and above this, conditions were not good and evidence of the recent rains was still very evident. Driving became a process of avoiding mud holes wherever possible and approaching those that we couldn’t avoid with great caution. The game viewing for the 70 kilometers to Xakanaxa was not particularly good but not surprising with the amount of water around and the bush looking the best it has in many years. The muddy conditions had slowed the convoy up a bit, but after a quick lunch stop at 3rd Bridge camp we headed for our final destination and were lucky to make it in time to set up camp just before sunset. The rain had thankfully stopped so our braai was soon in action once more and St Louis always present in numbers. The next morning we were off on a game drive and a visit to Dead Tree Island, which is just that, an island of dead trees. The story goes that many years back, one of the many water courses in the Delta changed its course and subsequently flooded this small area of large trees. Trees don’t live in water and now it’s Dead Tree Island. That afternoon we took a boat ride for an hour or two into the Delta’s waterways. 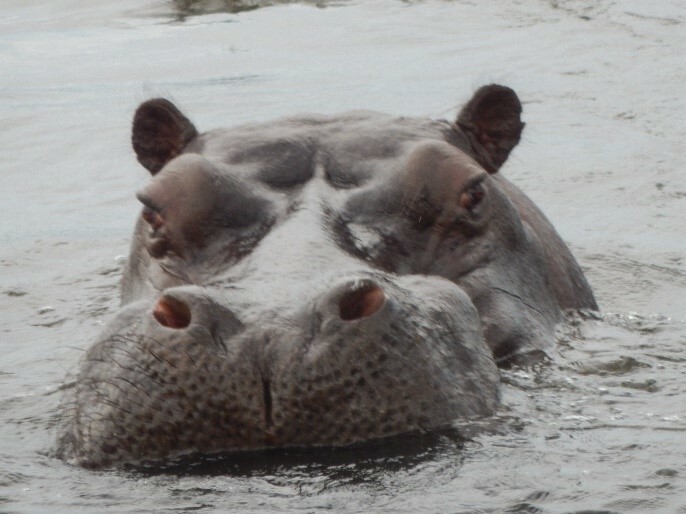 We got to spend quite a bit of time with a large pod of Hippo, keeping our distance at all times, especially since they had a few juveniles amongst them and Hippo are known for their aggressive behavior when they are protecting their young ones. The following day we took a drive to Paradise Pools, a place full of pools and trees and usually plenty of game. 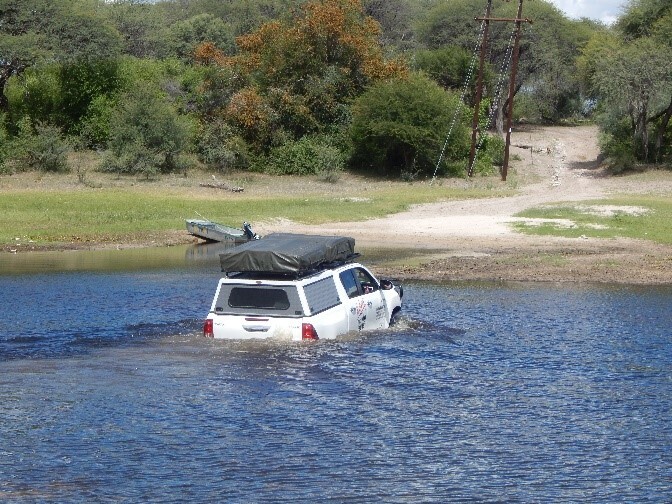 Again, the game viewing here was not good but watching some of our Hilux’s attempt the water crossing made up for it, like wise with the resultant recoveries. Never a dull moment and loads of ammunition for the next Bush Court Hearing. The next morning at the briefing we were all warned of the long day ahead of us as we made our way to Savuti camp in the Chobe national Park. We had not even reached the exit gate to Xakanaxa when the heavens opened up once more, this time in anger though. The ensuing conditions made driving difficult in places and the mud holes were by now overflowing. It was impossible to avoid all the big water holes that were all too often lined with thick bush on either side. There were a few close calls in some of those mud holes and on a few occasions I think it was rather the fear of intimidation and the “Straff Dop” that got them out and had nothing to do with our real friends in these conditions. We drove for Kilometer after kilometer splashing through the mud, it was over a hundred to go before we got to Savuti. Usually game reserves are hot, dry and dusty, so this was very different to the norm but it was a great adventure and the group were enjoying it all to the fullest, the spirit was high and the comments were flying. Once more we made it into camp with very little time to spare before sunset, we had another 9 hours in the vehicle and we could hear St Louis calling. The rain had thankfully stopped so we had our last bush braai together and of course the second bottle of “Straff Dop” where the past few days horrors came back to haunt them. No push -ups this time, everyone was showing off their strong points. The following day we were off in the rain once more, this time headed for Kasane in the north. It was a day just like the previous day, mud, mud and more mud. By lunch time we were required to swop batteries with three of the vehicles as the vehicle’s alternators had become caked up with mud and were no longer charging the batteries. Certainly no fault of the alternators, just way too much mud and gunge for too long. 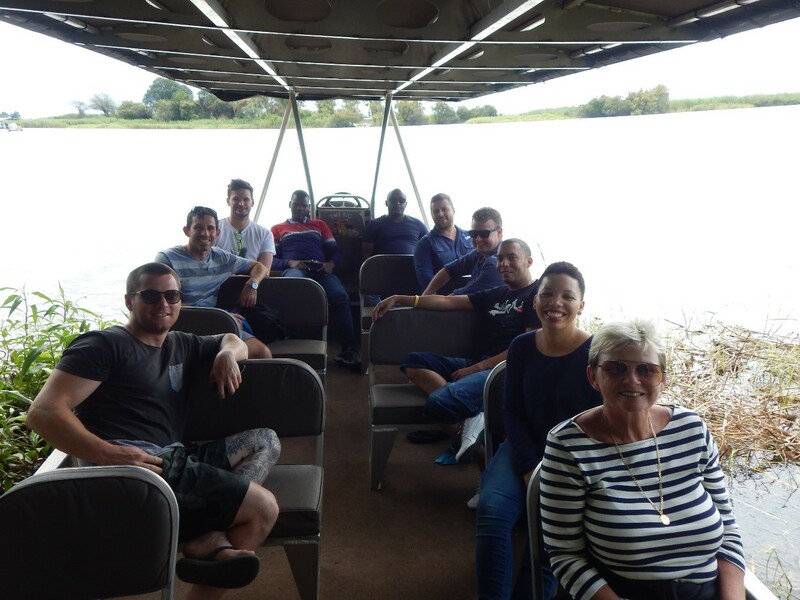 Once in Kasane, the group went on the Chobe river cruise which turned out to probably be the best game viewing to date. Elephants in their numbers, more Hippo and plenty of crocodiles. Whist this was going on, the vehicles had their alternators removed, washed out and then replaced and we were back up and running, ready for the two long days home in the morning. That night we had dinner on the banks of the Chobe River with staff from the Halfway Toyota Ngami workshop in Kasane. 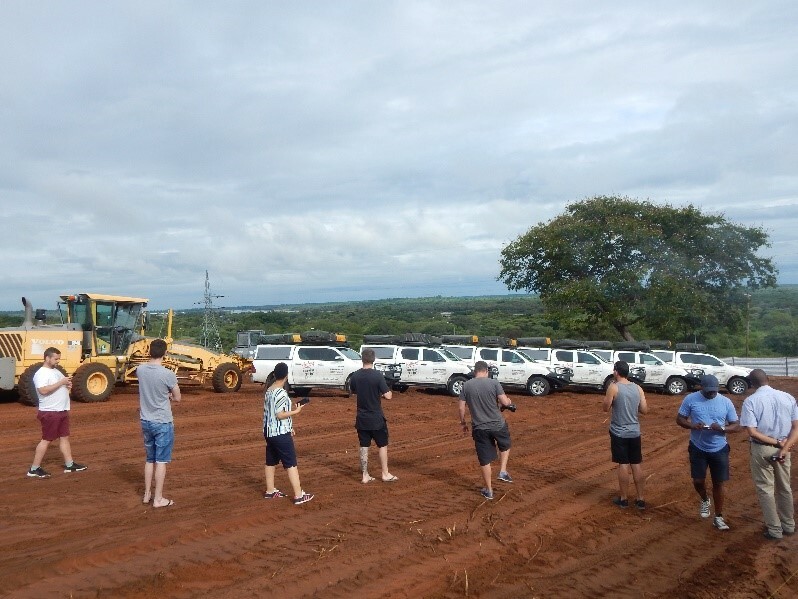 In the morning, we first paid a visit to the new site where Halfway Toyota Chobe is soon to be built. The bush has been cleared and the ground is presently being leveled out. It was tar road all the way to Francistown, our stop over for the night before setting out for SA at first light the next day. The rain was not over yet though and the rain Gods showed no pity that night as we had a good down pour whilst we were thankfully having dinner in the restaurant. It was out last night together as a group but the party did not click in as expected, the accumulation of long hard days in the vehicle and the thought of the 18 hour day for the 9 of us going all the way to KZN the following day we had an early lights out. Really, it was a great trip with lots of fun and adventures with memories to last a lifetime.